SAP Crystal Reports 2016 (Crystal Reports) helps you design, explore, visualise, and deliver reports via the web or embedded in enterprise applications. Crystal Reports is designed to use virtually any data source to help you produce the report that you want, whether you want to create a simple report or to use Crystal Reports' comprehensive tools to produce complex or specialised reports. NOTE: Crystal Reports 2016 is the latest version (released April 2016). However older versions (CR 2013, CR2011) may still available for order. Upgrades are only available to v2016. Please contact MicroWay for details. SAP Crystal Reports software is the de facto standard in reporting. With SAP Crystal Reports, you can create powerful, richly formatted, dynamic reports from virtually any data source -- delivered in dozens of formats, in up to 24 languages. A robust production reporting tool, SAP Crystal Reports turns almost any data source into interactive, actionable information that can be accessed offline or online, from applications, portals and mobile devices. Create highly formatted, pixel-perfect reports quickly with SAP Crystal Reports' intuitive design interface and efficient workflows. Deliver personalised reports to your business users' preferred destination in their preferred language and format. Connect to information sources spread across the organisation directly. Data sources include: Native, ODBC, OLE DB, and JDBC connectivity to relational, OLAP, Web services, XML, enterprise data sources, and salesforce.com. Enable SAP Crystal Reports developers to produce powerful "mash-ups" pulling data from various sources. Microsoft Windows 8 RTM, Windows 7 SP1, Windows Server 2008 SP2, Windows Server 2008 R2 SP1 and Windows Server 2012 RTM. Native, ODBC, OLE DB, and JDBC connectivity to relational, OLAP, Web services, XML, salesforce.com driver, legacy and enterprise data sources. Screen resolution of  x  is recommended. SAP Crystal Server software delivers affordable business intelligence (BI) essentials that enable intuitive, self-service information access to reports, dashboards, and data search and exploration. IMPORTANT: The Licensing Model for Crystal SERVER (2016) has changed from previous versions and features some new inclusions and exclusions. Contact MicroWay for details. NOTE: Crystal Server 2016 is the latest version (released April 2016) and the licensing model has changed when compared with earlier versions. However older versions (v2013, v2011) may still available for order. Please contact MicroWay for details. Ease the strain on IT resources and put business analytics directly into the hands of decision makers with SAP Crystal Server. Deliver reports, dashboards and data discovery for everyone – all within a managed, secure business intelligence (BI) server that’s quick to deploy. Ease the strain on IT resources and put business analytics directly into the hands of decision makers with SAP Crystal Server. Deliver reports, dashboards and data discovery for everyone – all within a managed, secure business intelligence (BI) server that’s quick to deploy. The software enables business users of all levels to make informed decisions and helps IT reduce reporting backlogs, administrative complexity and costs with configuration wizards, system monitoring, auditing, promotion management, and flexible licensing options. BI for everyone – Access reports, dashboards, and explore corporate data to get the critical information you need, all from a single solution. Instant mobile access; to information – Extend SAP Crystal Reports and SAP BusinessObjects Data Explorer documents to iPad, iPhone, Blackberry, and Windows Mobile devices. Get started Quickly – Simplified deployment and migration tools make configuration faster and easier. Common semantic layer - Make your corporate data easier for business users to access. SAP Crystal Reports software for enterprise - Create presentation-quality reports quickly with a new version of SAP Crystal Reports, optimised for accessing data through Universes. Data-driven publishing -Deliver personalised reports to a dynamic list of recipients. Integration with Microsoft Office and Microsoft SharePoint - Provide users with information inside the applications they work with the most. Security and integration - Integrate reports and dashboards into an existing security infrastructure. Fast and secure mobile deployment - Deploy quickly via a wireless connection with enhanced security and automatic transfer of administrative policies. Administration - Support lifecycle management, auditing, and monitoring to minimise ongoing cost of ownership. SAP Crystal Reports, SAP Crystal Dashboard Design, and SAP Crystal Server, add-on for mobile solutions licenses are purchased separately. SAP Crystal Dashboard Design viewing and SAP BusinessObjects Explorer are available with NUL licenses. Data driven publishing functionality is available with concurrent access licenses (CAL) only. Maintenance, including technical support, is available for purchase separately. Take control of complex data and give it meaning with SAP Crystal Dashboard Design (formerly Xcelsius). Turn raw data into sophisticated, interactive dashboards that will help you understand your data more quickly and thoroughly. Consolidate key metrics and information from multiple sources into a single dashboard to monitor business performance with SAP Crystal Dashboard Design software. Dashboards with what-if analysis and visualisations such as maps, charts, and gauges present critical business key performance indicators (KPIs) with drillable, interactive dashboard views that can be deployed within Microsoft Office applications, through SAP Crystal Server, or via Flash, web applications or mobile devices. Performance monitoring – Consolidate multiple reports and data from various locations into a single dashboard. Improved decision making – View corporate data in an understandable format. Predictive modeling – See the impact of your decisions immediately with what-if scenarios based on real-time data. Information management – Use the tools you already have to make information available to everyone. Take control of complex data and give it meaning with SAP Crystal Dashboard Design (formerly Xcelsius), personal edition. Turn raw data into sophisticated dashboards that will help you better understand your data and improve your decision making. Empower everyone to transform data into insightful, interactive dashboards and visualisations. Business users can turn any type of live company data into powerful dashboards – without help from IT. 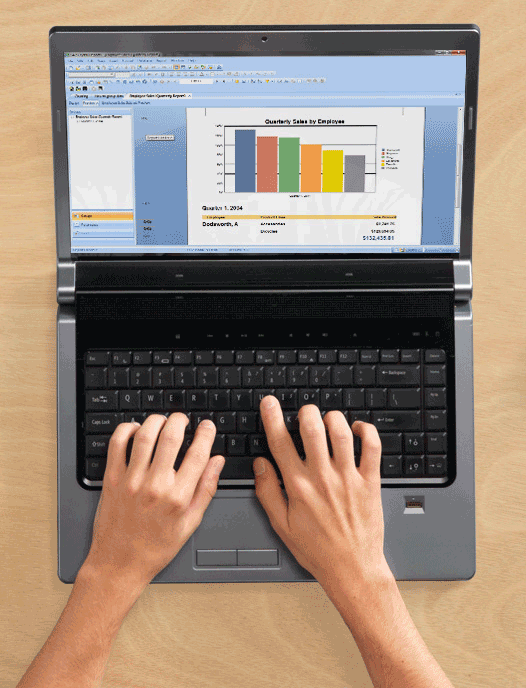 Microsoft Excel users can transform spreadsheets into interactive data presentations, in minutes, with SAP Crystal Dashboard Design, personal edition. If you can use Microsoft Excel, you can use SAP Crystal Presentation Design software to create eye-catching data presentations. Change number-intensive spreadsheets, such as financial results and complex calculations, into interactive, analytic visualisations. If you can use Microsoft Excel, you can use SAP Crystal Presentation Design software to create eye-catching data presentations. Change number-intensive spreadsheets, such as financial results and complex calculations, into interactive, analytic visualisations. You can present data and complex calculations in a way that that goes far beyond static tables, charts, and graphs, and can lead you to insights you may not have seen otherwise. Point-and-click ease – Build an interactive data presentation without any programming. What-if scenarios – See the impact of your decisions immediately. Prebuilt templates – Get started instantly with ready-to-use data presentation templates. Export functionality – Share your presentations via Microsoft Office and Adobe PDF.